Once you get it running every version of A/UX, do you have any further goals, such as accurate sound/network emulation, Mac OS support for every OS version the Mac II supported, Rudimentary MIDI support, etc? Those are my next two goals, sound and ethernet. Sound is hard because Mac II uses the custom "Apple Sound Chip" which is completely undocumented. Ethernet is hard too - I'll probably start both simultaneously and see which is easiest to complete. The SCSI driver sends a READ(6) request for 0 sectors, because it actually wants to request 256 (0x100) bytes, but the sector-length field in the SCSI command is 1 byte, so it gets truncated to 0x00. It dispatches a request that big because breada() queues up 16 16-sector readahead requests, and I don't know why yet... One possible problem is that the emulated SCSI disk responds to commands instantaneously, the very moment it DMAs the final byte of the SCSI command, which probably never occurs in the real world. He also added networking support for tapping into a tap device and bridge it with OSX ethernet devices ( http://tuntaposx.sourceforge.net/ ). , which enable easy setup of networking and Appletalk support for his version of BasiliskII. I think MAME has an even better implementation, and I may have to relent and peek at MAME code. I cannot find a single shred of documentation *anywhere* on the apple sound chip, and I can't fathom where MAME got its information. Maybe with help from an Apple engineer? I'll start taking a stab at ethernet soon too. Planning to emulate the original Apple "EtherTalk" nubus card, since every version of A/UX already has a driver for it, and Apple released its ROM source as example code. Lots of later 3rd party cards are "register compatible" with it, but it'd be simpler to just emulate the EtherTalk card itself. It sure works better now the disk isn't being silently corrupted... a 'feature' of 3.0.1 and 3.1 .. 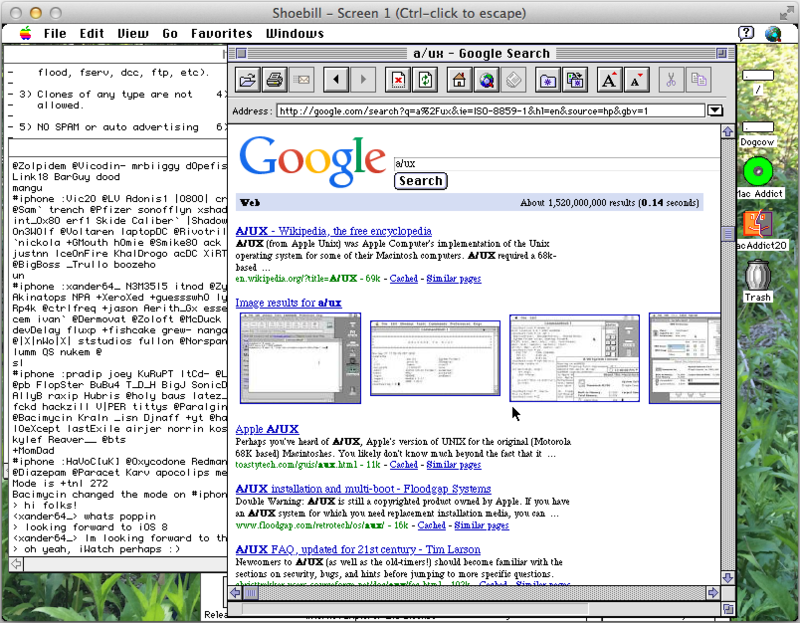 I'm moved by the prospect of running A/UX again, but before taking the plunge (finding all the necessary bits, and one computer to run shoebill -mine runs under OSX 10.7) I have an anxious question : can somebody tell me if Commando works ? 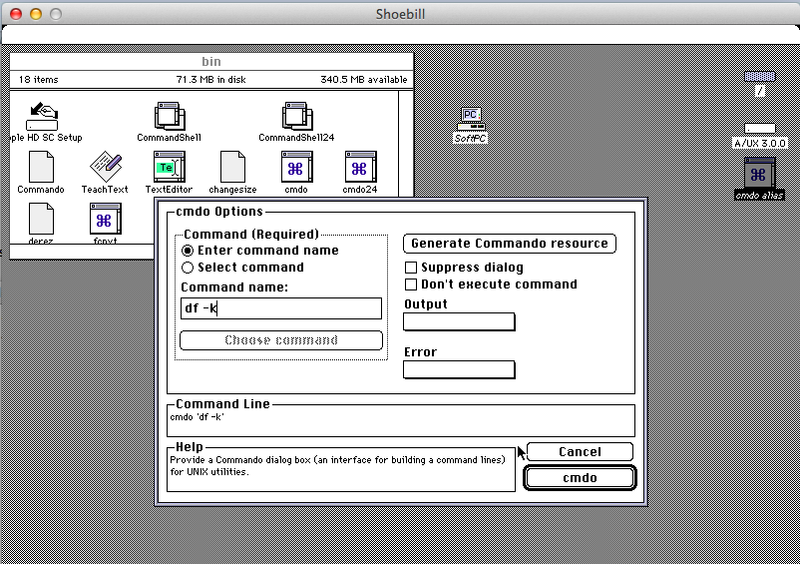 Commando is (was) a Mac GUI for Unix commands (grep, find...) that was built in A/UX. You could either double click a Unix command in the Finder (to try, navigate to /bin or /usr/bin and double-click on grep) or enter a Unix command name in the shell (without hitting enter key) and use Cmd-K (if I remember correctly). The magic of Commando is that it offered a GUI covering the many options of Unix commands, and showed you the resulting command-line built according to your choices. Thanks a lot to pruten and to anyone who can answer my question. Although I never was much of a cmdo guy. Commando works AFAIK, but I've never used it much either. Also, Shoebill v0.0.4 is now "officially" available! Should also run more stably under heavy I/O load with that fixed SCSI thing. The windows and linux binaries run on my ubuntu/win7 VMs, but I haven't tried them anywhere else. So lemme know if they don't run on Gentoo or Windows 8 or wherever. both x86/x86_64 run on my Windows 7 x64 machine. However my 'torture' test of SoftPC is insanely slow with the x64 build, and double insanely slow on x86.. Maybe timers are too accurate? I see it taking up about 1/3rd of the CPU for what it's worth, so it's idling, but maybe too much or too long...? But your cross environment works! You can use hostinger. Because I am from Bangladesh but I can use it! Which lead to 3.0.0 corrupting itself in a way that it wont' boot anymore.. thankfully it's emulation otherwise yeah re-install. The latest SCSI fixes let you runt the Apple HD SC setup program without it bombing out the SCSI bus, so at lest that is nice. Building on Windows I ran back into the seekto vs seek stuff, and some sys_errlist being undefined, so I just changed it to "" to make gcc happy. And linking I had to add -lpthread into the library list. The PRAM is working on windows, so it's nice not to have to constantly re-set the mouse click speed. the prospects of meeting Commando again are fading, it seems. First, I've tried to run shoebill under Linux (this Linux running in a VirtualBox VM, the host being Mac OS X 7 (Lion) with no success. I had to install SDL, and after that, nothing. I mean, I tried to boot with A/UX installation images, and when the programs didn't exit immediately with some error message (telling me I had made a mistake somewhere), it just produced nothing. I've check the ROM file(s) (I tried several), and shoebill complained when it was not correct. I've checked the image files (I had messages that it couldn't find root partition, that "The root A/UX disk needs to be at scsi ID 0", and several others that I haven't written down). In the end, after some trial and error, it *seemed* I should be OK (no complain from shoebill), but nothing happened. The program used about 6% CPU, but nothing appeared on screen. No message, no window. After that, I've tried to recompile shoebill (both with command line and with Xcode) under Lion. No success. At the command line, the archive manager complains that it cannot determine the architecture (both i386 and x68-64 objects had been compiled). Under Xcode, several files (nib files, if I remember correctly) were incompatible. Well, my last try was to install Mavericks in a Virtualbox VM in order to use shoebill precompiled binary. Here too, no success : I cannot manage to install 10.9 under Virtualbox (the host being 10.7, of course). All that on a Core i5 Mac Mini. Hey guys - sorry I've been neglecting this thread, been super busy lately. Can you post the names of the A/UX images you've been trying, and the command you've been running? Off the top of my head, I don't think shoebill can just exit without printing some kind of error message. I may have been unclear in my description, but when shoebill doesn't complain due to a bad ROM file or due to "The root A/UX disk needs to be at scsi ID 0" (among others), it doesn't silently exit. It doesn't exit, but doesn't print or display anything either. Here are two command that produce this result (no exit, no message, no window). These are image files I found reading this thread. I've tried to add a second disk (disk1=...), but it didn't change anything. Is it true you have a space in "Macintosh\ IIcx.rom" ? You can name your rom file "macii.rom" so you don't have to specify it. You might want to try to set verbose startup by adding "verbose=1" to your command line. You can also set the preferred size of your window with "height=768" "width=1024"
No effect. Neither the window size (but as no window appear, it's not a big surprise) nor the verbosity change anything. As for the ROM file name, I renamed it to remove the space, just in case, but I would have been very surprised if it had changed anything : shoebill prints an arror message if I try a bad ROM file. I guess the problems lies in the opening of the window (but why no error message ?). Installing the most recent Linux Mint distribution, things appear far better. I've succeeded in launching shoebill (same command line than before). Only problem : no mouse cursor. It *seems* (I mean, I'm not sure) that the mouse cursor stays at the bottom-right corner and never moves. Anyway, as there were error messages in the console (stating that I had no 3D acceleration, and that I should), I reconfigured the VM with 3D acceleration. This time many more error messages (OpenGL related) and the program exits. Still not there, but an improvement nevertheless. For information, I also tried in a XP VM, but no way. It crashes immediately. EDIT : just tried Wine, in a Vista bottle (in Wine speak), and it sorta works. Problems with mouse cursor : there are two, the Mac cursor and the emulator's cursor, and it's difficult to reach your target with the emulator's cursor (is there a way to run full screen ?). I still have to understand how to install A/UX on a blank disk, but anyway, that's good for now. > I still have to understand how to install A/UX on a blank disk, but anyway, that's good for now. I did this earlier in this thread... It's a little involved, but once you get the methodology down it's not that hard. You need a disk with a UFS and a swap partition, format the UFS, backup the install media's live partition, and restore it to the UFS target. recreate the named pipe files that dump/restore can't recreate and then you are good to go. I've done this with a quadra back in the day, and it is SO MUCH FASTER on shoebill. Until Shoebill can talk to the outside world I wound't sweat it too much, and to run old MacOS programs try another emulator, but for some retro A/UX fun, this is the only way to go. Man, you are dedicated to getting this thing to work! XD I've had problems with the mouse on shoebill on linux virtualized on OS X too - something about the way the mouse is virtualized doesn't play well with SDL2 on linux. Probably something like that is causing a problem with Wine too. You can build the SDL2 gui natively on OS X 10.7, that might be the easiest, most robust way to get things running. All you need is are the SDL2 dev libraries, and then you can run sdl-gui/osx_build.sh (provided you also have Xcode and the cli dev tools). It built on 10.7 at least once successfully, but I no longer have access to that machine - or I'd post a binary And it seems to still build on 10.10 beta without much complaint. I should have read carefully everything you wrote, and I'd have been able to recompile this version earlier. Anyway, it's almost perfect (still cursor issues, but less than with Wine). Thank you (and also to everyone that^H^H^H^H who helped). Lets reverse the flow from public to private and make the private public! This is amazingly impressive. Is there any hope of getting a "Unix" disk or its equivalent?